Charlie K. slouched further into the lawn chair, his thermos to his right and the Delahaye drophead sedanette, 1936, on his left. It had been a long day. The charity car show had drawn record crowds, as record rains had dampened spirits for weeks, and a day in the sun proved irresistible—even to the wives, who regarded car shows as trials to be endured. By 3 o’clock, facing the task of gathering his sign listing the Delahaye’s statistics and awards and other gear for the long drive home-closing was at 4, Charlie’s eyelids grew heavy. A brief nap, considering that crowds had mostly gone, seemed appropriate. A voice shattered his reverie. “My little girl would like to look at your car, would that be ok?” Looking up, Charlie saw a man, likely under 40, with a child of about 5 pulling him forward. Giving a start—the girl seemed familiar—except for the hair style, she reminded him of Hilda! Gloria, deceased 10 years ago, his wife for 29, and Charlie had a daughter, Hilda. During a dangerous operation to repair a faulty heart valve when she was 8 years old, she slipped into a coma and died. Gloria never really recovered from the loss, but Charlie, always busy and sought after, soldiered on, even as Gloria slipped away years later. After all, he was the keeper of the Delahaye, as was his uncle Edward who bequeathed it to him. Not really “owners” as both men realized, since the real owner was Maurice Chevier, chief engineer for the Delahaye factory outside Paris, who planned to reclaim the car after the war. Edward was the Paris correspondent for a British magazine, and rented a room in the house of the Chevier family, informally becoming a part of the family as war clouds hovered. 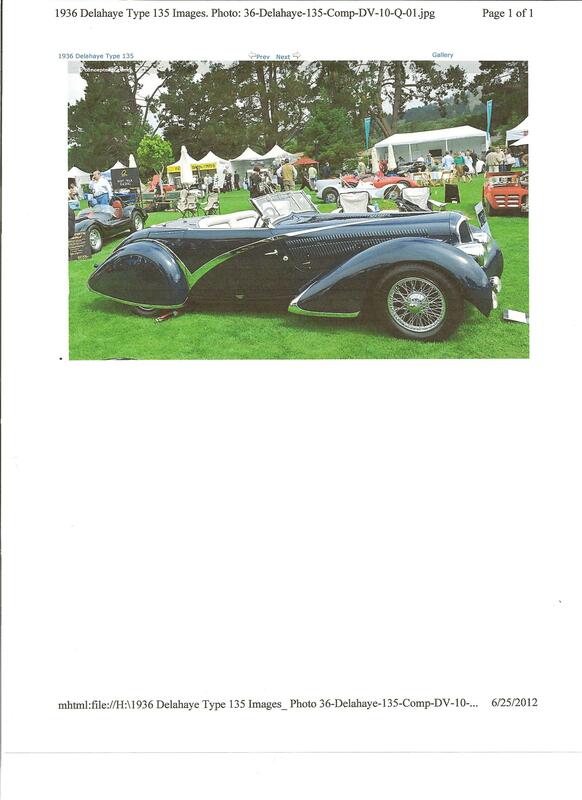 He kept their children amused with his fractured French as the Delahaye, piloted by Maurice, sought out picnic spots and beckoning streams on holidays. As news of the Panzers’ audacious flanking maneuver, rendering the Maginot line useless, reached Paris in 1940, panic reigned, not least in the Chevier household. You see, the Cheviers were Jewish. Maurice got train tickets to Marseille, where sanctuary might be found, or an exit to somewhere—Algeria perhaps, might be achieved. He figured that gasoline, already rationed, would leave his family stranded like so many streaming out of Paris by car. So he assigned uncle Edward as leaseholder of the house, and signed the Delahaye over as well, the idea, over a handshake, that all would be restored after the war. Uncle Edward had press credentials, and figured that he would be reasonably safe as it seemed that French forces began to stiffen for a brief time, before finally collapsing in a rout. Finally he too had to consider flight, but not until he had found enough gas and containers to risk a high speed trip to an embarkation point not already overwhelmed with refugees. Getting 3 more escaping Brits and himself with enough room to operate the controls into the car, entwined among gas containers (no smoking, of course!) threading through road chaos, insane speeds, starless nights with lights off much of the time got the scruffy band finally across the border into Spain. A flurry of bribe negotiations, wheedling and bluffing eventually got Edward and the Delahaye, along with his companions, to the port of Folkestone. The overwhelming odor of stinking fish followed the car and its passengers all the way to the farm where it disappeared under wraps, generously conferred by the barely seaworthy hulk which delivered them to safety. Edward spent the war years editing manuals for the War Office—navigation for pilots, radio protocol and codes, camouflage techniques, first aid in the tropics, venereal disease prevention programs, how to read gunnery tables and maps, etc. Now and again he would slip over to the refugee office to pore over lists of persons known to have escaped occupied France, hoping to find M. Chevier, his wife Berenice or their children, Nathaniel and Nanette. Nothing, nada. Retrieved from beneath layers of tarpaulin years later, Edward aired up the tires, found a battery and paid the farm family for storing his treasure, attracting bystanders all the way to London—still stinking of fish, but the top was down, drizzling all the way. So to Charlie K., today’s servant of the Delahaye, tinkering, polishing, exhibiting, holding various offices of the car club, arranging trophies, busy as usual. Her father, Ted, as he introduced himself, explained that his daughter’s name was Christina. She could speak, he explained, but rarely did. Oddly, up to now she seemed able to make her needs known to her parents but they were concerned that she would have difficulty in school on this account. They have engaged professional help to overcome Christina’s speech reticence but so far to no avail. He also mentioned Christina’s odd interest in car shows, to which she was determined to go, and drag her father up and down every row, taking in every detail of the vehicles on exhibit. At that point, Charlie thought it would be interesting to show his prize to the little girl, deciding to open the driver’s door rather than, as he customarily did to show adults, open the bonnet to expose the exquisitely crafted motor. At that point, she pushed past him, mounting the running board and holding her arms up as though asking to be lifted into the seat behind the wheel. Her father was startled, and came forward to remove Christina from the car, but Charlie explained that the seats were covered with African water buffalo hide and could handle all the punishment little feet could administer without blemish. At that, without thinking to ask her father’s permission, he picked her up and placed her, standing on the seat, her small hands firmly gripping the mahogany rim of the steering wheel. Both, startled by the child’s determination, tried to make sense of the scene, as Christina seemed transfixed by all the shiny levers and dials facing her, as though reliving a prior memory or event. Her right hand released its grip on the wheel and took hold of a chrome lever within its circumference. “What’s this?”, she suddenly asked, addressing herself to Charlie. Charlie answered, his eyes darting to Ted for assurance, “it’s the spark control, Christina”. “What’s a spark?” Christina asked. Reeling back through decades of memories to how he would have replied to Hilda at that age, Charlie replied:” a spark is a beautiful thing, but the wrong kind can hurt you. In this case, sparks are what make the motor run”. While trying to process whether a 5 year old could have any idea what he was talking about, Christina spoke again, as her left hand reached for a chrome lever to the left of the first: “What’s this?” she asked. Christina’s hands returned to the rim of the wheel, gently rocking it and herself to the right and the left, her eyes fixed on something she seemed to see ahead, as though intent on a journey. After watching her lost in her task for a few minutes, her father gently lifted her into his arms, telling Charlie that she was obviously getting tired, and that they needed to get home. Charlie, composing himself, said:”I was surprised—Nanette is a beautiful name—it seemed familiar, not sure why”. Charlie decided not to explain the details to Ted at this time—maybe later. As the Delahaye neared Ted and Christina’s neighborhood, Ted announced that they needed to be let out at the corner since, as he explained, the street was being repaired. Christina lifted her arms, just before she and her father walked away, inviting Charlie to lift her up, at which she grabbed his neck and kissed him on the cheek. A few miles down the road, Charlie was overcome. “Busy Charlie” pulled over, turned the engine off, and sobbed for a few minutes. He’d never done that before. Composing himself, he felt lighter, almost giddy. When he got home, he remembered nothing after leaving Christina and her father at the corner—as though the Delahaye had an autopilot. Time passed, Charlie’s task list ticked off like clockwork as usual. Scheduled car shows included one which would take Charlie by Ted and Christina’s neighborhood. Looking forward to meeting them again, Charlie called the number he’d recorded in his book. The message he got when he called the number was:”Please check the number—the number you have called is unassigned. Goodbye”. Consulting his sheaf of maps, the street and number Charlie recorded in his book turned out to have been, before the “Blitz” of 1940-41 a residential block, but since its obliteration was rebuilt as a power substation. 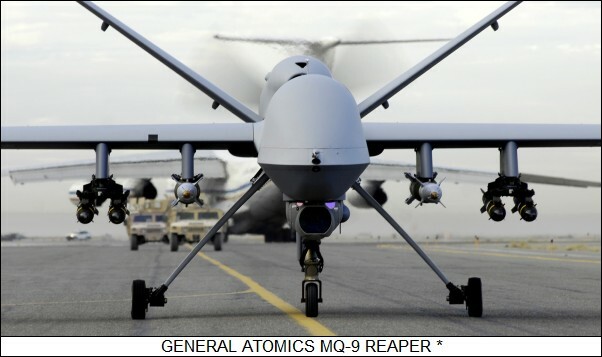 Above is an example of the current generation of “Drones”. Invented nearly 80 years ago by a Hollywood actor, produced during World War II to replace towed targets previously used to train anti-aircraft gunnery units. 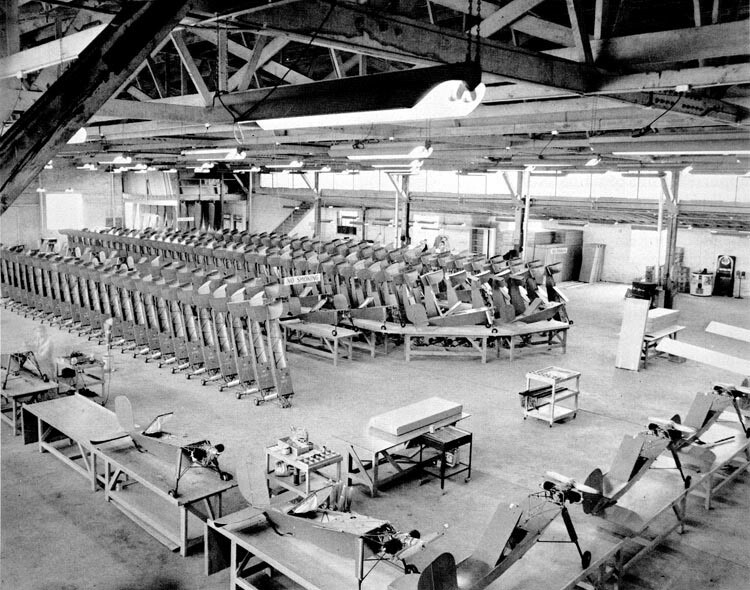 An assembly line worker in the factory in which the military drones were produced later became a Hollywood actress known by everyone. HISTORY OF THE UAV/DRONE (with some surprising “actors”)involved in the process. “MARILYN MONROE” did not exist. Her real name was Norma Jean Baker. The item below explains her history in the defense industry in World War II. 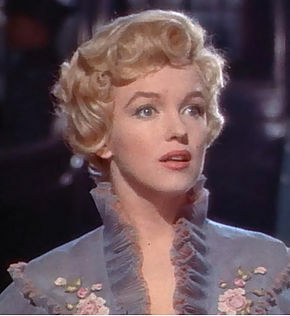 Her mother was placed in an institution for the insane when Norma Jean was 6 months old. Her upbringing since that time was in a series of foster and orphan’s homes. She married a 21 year old neighbor when she was 16, (the marriage arranged by her foster mother because the family was moving and Norma Jean was not included). As an emancipated adult, then named Norma Jean Dougherty, she took a job at the Radioplane Company, later a part of Northrop Aviation. Her husband was drafted and, on his return years later, divorced. Below is the rest of the story. Along with her role in the development of Drones—along with a few others. Performing in more than 200 movies and stage shows between 1898 and 1966,Reginald Denny played both comic and dramatic roles alongside the greatest stars of the day. 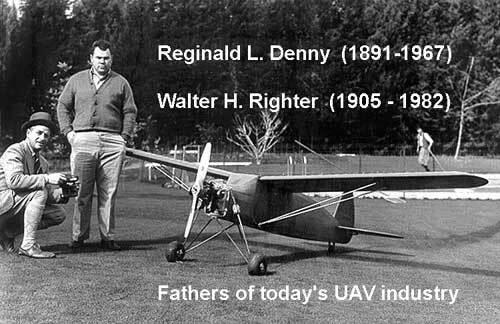 Somewhat less well known however was his pioneering work with engineer Walter Righter in the field of radio controlled, pilotless aviation. In the 1940s, the mass production of Denny and Righter’s “Radioplane” target drone led to the widespread adoption of radio controlled aircraft by the military for not only training AAA gunners but also combat roles from the Pacific Theatre in WW2 through to the present day. The “Dennyplane”, a mid 1930s pre-cursor to the “Radioplane” and powered by Righter’s “Dennymite” engine, was one of the key products that brought model aviation to the masses in a post-depression, pre-war America. The war effort brought persons and activities together in unlikely ways, leading to unexpected outcomes. In this photo, the army magazine Yank sought to boost morale by presenting a defense worker as pinup girl. No one could know that this young propeller technician, nineteen-year-old Norma Jean Baker Dougherty, would later remake herself as the most glamorous of movie stars, Marilyn Monroe. 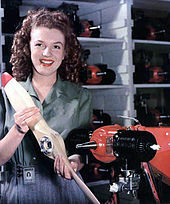 Having arrived in California, Norma Jeane managed to get a job at the Radioplane Co. as an assembler on the OQ-3 production line. On 26 June 1945, army photographer David Conover was sent to the factory by his commanding officer, one Captain Ronald Reagan (an acting buddy of Reginald Denny’s), to photograph women war workers. California, June 15, 1944, from Norma Jean(e?) to a friend. I was so happy to hear from you. I was so thrilled to read your letter and learn of all that you have been doing lately. I will send you your picture very shortly now, I’m going down Saturday to find out more about it. Also will send you lots of snap shots at the same time I send you the picture. I found out that a 10″ x 12″ (that was the size you wanted, wasn’t it ?) costs exactly $ 5.00. I am working 10 hrs. a day at Radioplane Co., at Metropolitain airport. I am saving almost everything I earn (to help pay for our future home after the war). The work isn’t easy at all for I am on my feet all day and walking quite a bit. I was all set to get a Civil Service Job with the army, all my papers filled out and everything set to go, and then I found out I would be working with all army fellows. I was over there one day, there are just too many wolves to be working with, there are enough of those at Radioplane Co. without a whole army full of them. The Personal Officer said that he would hire me but that he wouldn’t advice it for my own sake, so I am back at Radioplane Co. partly contented. Well I guess that is about all for now. Radioplane before its skin was applied. 70horsepower Rotax engine, 3 tube radio receiver, several pounds of battery to power it and servo motors, launched by catapult, lost if hit during gunnery practice–or if landing–a tricky business with no nose camera. An improvement over towed targets previously used. The Radioplane factory–must have been lunch break.